We got home last week and I immediately started thinking about post-vacation recovery foods. Kale salads, green juices… that sort of thing. That is until Jack announced that he was craving bread. Which sounded good, so bread we had. This cozy little crostini turned out to be perfect for our lazy, rainy weekend. (Kale salad, on the side). This sweet potato spread – it’s halfway to hummus. It’s thicker and has a stronger tahini flavor, which was a nice contrast to the light & airy ricotta. It’s also a convenient way to use up a bit of leftover baked sweet potato and a partial can of chickpeas. Which were the lazy-person ingredients I happened to have on hand. In a small food processor, blend together the ingredients for the sweet potato spread.Taste and adjust seasonings. 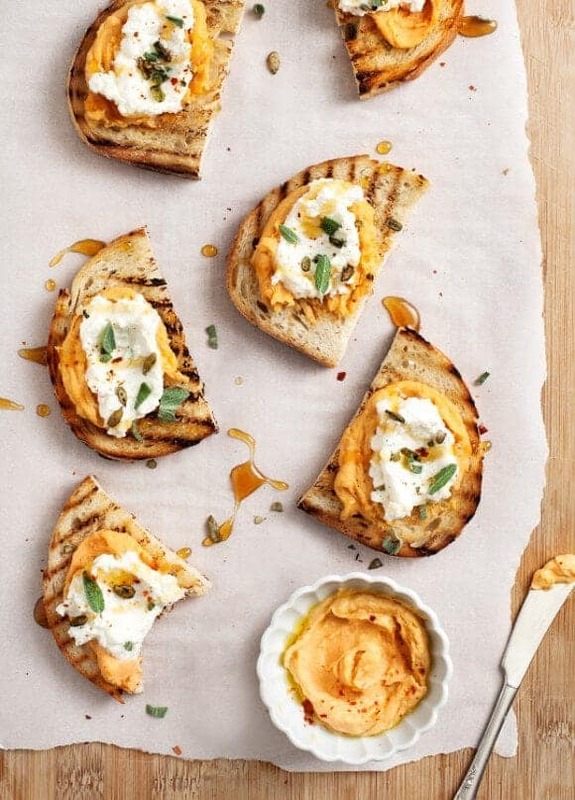 Top grilled bread with a bit of the spread, a dollop of ricotta, chopped sage, a drizzle of honey, and a few pinches of coarse salt. Feel free to play with different spice/herb variations: Cayenne, cumin, and/or dried coriander would be nice mixed into the spread. Or switch out the sage with rosemary or thyme... whatever you like. I think a bit of toasted sesame oil would pair nicely with the tahini (although I wouldn't pair that with ricotta). 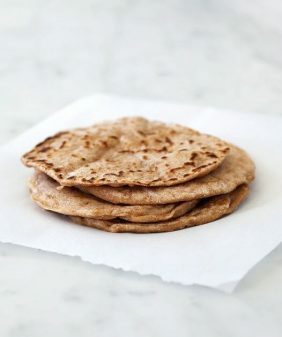 vegan option: skip the ricotta and add more chickpeas to the spread to make it a bit lighter, if necessary. LOVE LOVE LOVE! Your pictures are wonderful…. 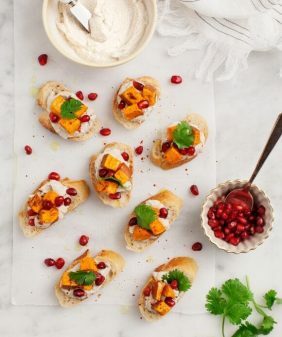 love the idea of making a hummus-like sweet potato spread. Super creative, I love it. I love using cashew butter in sweet potato spreads. For more of Asian feel when you use ginger, soy and coriander but I guess you sick of asian food. Sounds killer good…and thanks for not actually calling this hummus! Welcome back! There’s is always a bit of an adjustment period after a long spell away from home. It usually takes me a few weeks to really get back into the grove of things. But your Japan trip was awesome! Thanks for sharing. I love your sweet potato spread–I’m always looking for more ways to use sweet potatoes. Thanks, I’m glad you liked the Japan posts… yep, I’m definitely having a hard time getting back into the swing of things! Oh goodness! I’m the tahini queen so this looks just perfect! I bet cashew ricotta would be a yummy vegan option but the spread alone sounds divine. I think cashew ricotta would be a delicious sub! 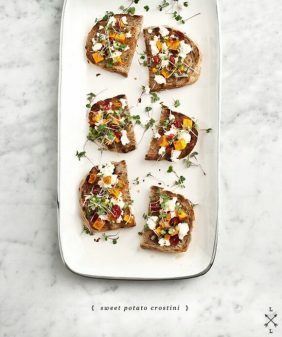 I love crostinis, any excuse to eat more bread, really, and love this idea for a lighter sort of hummus. Paired with the ricotta that sounds amazing. I’m throwing a pumpkin themed party in a week. 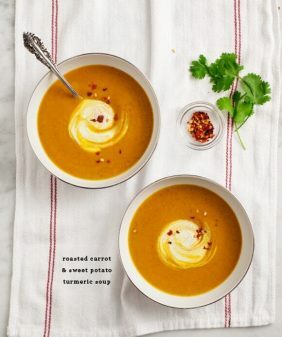 What are your thoughts on using a pumpkin puree in place of sweet potato? …Though I would consider squeezing sweet potato into the theme since it fits the orange and Autumn theme! Yes! Pumpkin, butternut squash… they’d all work just fine. (fresh, not puree from a can). Sounds like a fun party!! Must not read your blog at 5 pm unless I have time for a grocery run. All I can think is how soon can I make this happen?? YUM. This is very imaginative and so pretty! The flavors sound like they would mesh beautifully. Bookmarking it now! I loved hearing about your trip, too, by the way and all the tales of Japanese cuisine. So pretty and so delicious! I love the flavors! what a creative idea! I love this hummus hybrid! 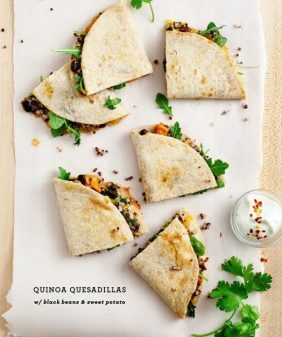 This would make such a great quick snack! This looks great. I have been enjoying my cashew cheese spread on toast in the mornings but I might change over to this once it’s done. this spread is so tasty and I am enjoying it right now. thanks for this wonderful recipe! Well aren’t these just the most adorable crostini ever! So elegant and beautiful! Pinned! If you have a moment, do you mind checking my log out please? Thanks! This sounds (and looks!) so good. While I love tahini, I rarely use it in cooking. Do you have a suggestion of what brand to use? Hulled, unhulled, roasted, raw, salted, unsalted??? Yikes! Hi Ame, right now I’m using Whole Foods’365 brand tahini. The package doesn’t say whether it’s hulled or unhulled, but it is roasted. Hope that helps! Wow, this looks amazing! Love the sweet potato spread! Great recipe! Pinned! I may like the sweet potato spread even more than hummus. I’m trying to think of other ways to use it (I made a double batch, as 1 sweet potato made about 1 cup mashed). The fried sage is a nice garnish. Viva la sweet potato…love them as fresh cut fries drizzled with coconut oil, salt & cumin…happy feasting! This looks absolutely delicious. 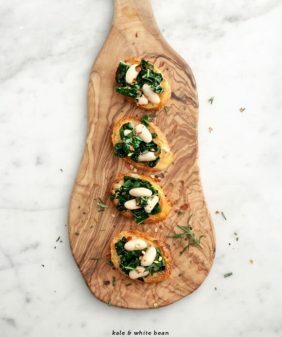 Wonderful easy appetizer for Thanksgiving, yes? Shared on FB and Pinterest so I can find it again and again. yes! It would be a great thanksgiving appetizer (you could even make the components ahead of time), hope you like!